On Sunday 24th March it'll mark the three year anniversary of the passing of Johan Cruyff. 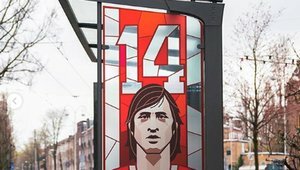 As a tribute to the great man, the streets in Amsterdram have been decorated with posters of his image. A creative agency and a street artist have united to create this tribute to the Dutch legend in the city which he was born in. FC Barcelona have also wanted to remember the player and coach of the club in the week before the anniversary of his death. They held talks about the icon to La Masia players in the male and female teams. In these sessions there were three videos shown on the life of Johan Cruyff. One was about the player, another during his time as a coach and lastly about the mark he's left on the style of football they produce at FC Barcelona.